The Age of Discovery is an informal and loosely defined European historical period from the 15th century to the 18th century, marking the time in which extensive overseas exploration emerged as a powerful factor in European culture and globalization. Many lands previously unknown to Europeans were discovered during this period. 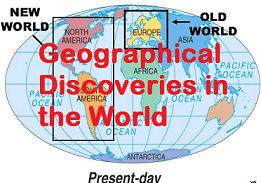 European overseas exploration led to the rise of global trade and the European colonial empires, with the contact between the Old World (Europe, Asia and Africa) and the New World (the Americas and Australia) producing the Columbian Exchange: a wide transfer of plants, animals, food, human populations (includingslaves), communicable diseases and culture between the Eastern and Western Hemispheres. Following is the list of important geographical discoveries and their discoverer.